Tha Sophat has lived partly on milk he suckles directly from a cow since his parents moved to Thailand in search of work. 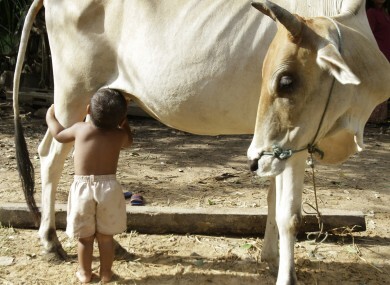 A CAMBODIAN MAN has revealed that his young grandson has lived partly on milk he suckles directly from a cow since the boy’s parents left their rural village in search of work. Um Oeung says 20-month-old Tha Sophat started suckling the cow in July after he saw a calf do the same. Um Oeung told The Associated Press he pulled the boy away at first. He relented after his grandson protested loudly and the boy has suckled the cow’s milk once or twice a day since then. Tha Sophat has lived with his grandparents in Siem Reap province in northwest Cambodia since his parents moved to Thailand looking for work. Um Oeung said Friday the cow doesn’t mind the boy suckling but he is worried about his grandson’s health if he continues. Reuters reports that the man’s neighbours are not happy about the boy suckling from the cow, and that they say the child will be “ashamed when he grows up. Email “Photos: Cambodian toddler suckles from cow after parents leave village”. Feedback on “Photos: Cambodian toddler suckles from cow after parents leave village”.